I don’t actually own a SUPER FOOT WARMER (I put a space heater next to my desk when my feet get cold), but this product was recommended by Billfolder Meg Renninger and I trust her assessment that it gets the job done. The SUPER FOOT WARMER is a heated rubber mat that fits under your desk. You put your feet on it, and your feet get SUPER WARM. The Amazon details claim the product is “not for use on wood, carpet, or other delicate surfaces,” so only purchase the SUPER FOOT WARMER if you plan to put it on something SUPER TOUGH. If you like ergonomics, there is also an ERGONOMIC VERSION, though neither Meg nor I can vouch for that one. The SUPER FOOT WARMER. Buy it, or literally anything else, on Amazon — because even if you aren’t currently under a RECORD-BREAKING POLAR VORTEX right now, you may well be in the future. Climate change will come for us all in the end, but we might as well have warm feet while we can. 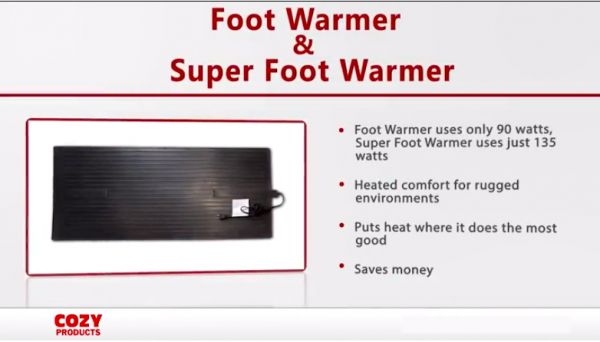 Photo credit: Super Foot Warmer promotional video.